The underlying expectation here — that without Western civilization humans would become monsters — is a psychic tic of game designers, who tend to be overeducated upper-middle-class men whose primary lens for understanding the world comes from commercial entertainment. If your worldview is built around a series of compromises you’ve made to secure a comfortable salary building eidolons of human narcissism into restricted-admission dream-states, paranoia and projected self-loathing are in order. And when these labors make you servant to an economy of Moore’s Law and inescapable obsolescence, the competition for scarce resources (conveniently abstracted in the game with overlaid icons, as if Google Glass were the only thing to survive the collapse of human civilization) must seem like an especially poetic prism. I actually think Thomsen’s position here is correct — but where he sees a bug, I see a feature. 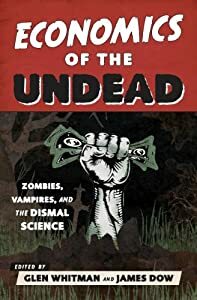 What stories of the zombie apocalypse (and other post-apocalyptic stories like Y the Last Man and Revolution) do best is throw our current prosperity into sharp relief — and make us ask what that prosperity depends upon. This is a theme that appears repeatedly in Economics of the Undead, particularly in Chapters 3 and 5. Why should the zombie apocalypse cause such a drastic collapse of living standards? In short, the answer is that the modern world economy relies on a vast (and vastly complex) web of social cooperation, and that web is built on specialization and division of labor. We consume goods and services assembled using resources (including labor) from around the world. This happens for the most part without central planning, and without most people knowing more than just a handful of the millions of people they’re cooperating with. The zombie apocalypse plays havoc with that web of social cooperation, in a couple of different ways. First, the zombies kill off (or convert) large numbers of people who fill key positions in the division of labor. I’m not just talking about medical doctors and nuclear engineers; I’m talking about truck drivers, crane operators, operations managers, and thousands of other people whose small individual contributions add up to massively complex chains of production and trade. The system has enough redundancy to be able to tolerate occasional losses; after all, people do retire and change jobs from time to time. But when it happens all at once, as in most apocalyptic narratives, the system collapses. Second, the zombies massively increase transaction costs — that is, the costs involved in making exchanges occur. We are accustomed to a world in which transaction costs are typically low; we can communicate with others and make deals without much difficulty. A phone call or coffee-shop meeting is often enough. Negotiations over terms of complex transactions may take longer to conclude, but they still usually don’t involve any threat to life and limb. But when the phone lines are down, the police have disbanded, and zombies roam the landscape, it becomes much harder to find people to deal with, to hammer out the deals, to actually hand over the goods or provide the services in question, and to punish the cheaters and bandits. That means survivors have to do a lot more for themselves, and what trading they do will tend to be restricted to small communities instead of the whole wide world. The result? A dramatically, painfully lower standard of living. All things considered, then, the prospect of a zombie apocalypse does make the modern world seem worth keeping intact… if we can. This entry was posted on Wednesday, September 3rd, 2014 at 8:46 am	and posted in Uncategorized. You can follow any responses to this entry through the RSS 2.0 feed. Enrique, I totally agree. I did mention law enforcement in passing (“the police have disbanded”), but perhaps I should have emphasized that more. However, I suspect the other transaction costs I mentioned are at least as important, if not more so. If the transactions never happen in the first place due to lost lines of communication and zombies standing between the potential transactors, the police will have no transactions to enforce. I think the world of the Walking Dead does depict the emergence of various groups and organizations of that nature — the town of Woodbury being the best example. Check out the two chapters by Brian Hollar. But of course, Nozick was describing the beginning of an evolutionary process that he believed would end with a monopoly state.